The FPUGR100 Series has been discontinued. Please contact our Flow and Environmental department for possible substitutes. The FPUGR100 and FPUGR200 series positive displacement pumps output a relatively constant flow rate regardless of outlet pressure, providing an almost pulsation-free flow. Pumps are self-priming up to 20 feet dry with new gears; however, running the pump dry will substantially decrease gear life. The FPUGR100 and FPUGR200 series feature Buna (FKM optional) zero-leakage lip seals. To protect against excessive back pressure, order a model with a built-in relief valve (models with “-R”; suffix); otherwise, a blocked discharge line can raise back pressure and damage in-line components or the pump. The FPUGR100 series feature self-lubricating bronze gears and carbon-graphite bearings, making the FPUGR100 pumps ideal for non-lubricating liquids such as water and certain solvents. All FPUGR100 motors are continuous duty for 60 Hz Vac, feature open drip-proof enclosures, operate at 1725 rpm. For 115/230 Vac units, the customer must rewire the power cord and a suitable plug for 230 Vac. The 230/460 Vac units must be hard- wired by the customer. The FPUGR100 Series are limited to operating with fluids having 500 SSU (100 SSU for the FPGR109 series) maximum viscosity. 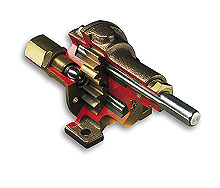 FPUGR200 Series pedestal pumps require user-supplied motors (up to 1725 rpm max.) and can be used with fluids having up to 100,000 SSU viscosity with the proper motor. Gear pump motor rpm must be reduced when pumping viscous liquids (refer to Speed Reduction Table on page L-5), and horsepower must be increased over that which would be required for pumping water (33 SSU). Use the Multipliers for HP Table and multiply by the water horsepower (from the Performance Table on page L-5) to arrive at the viscous horsepower (see “determining required horse power for viscous liquid” example following the Tables on page L-5). The FPUGR200 is used for non-lubricating liquids such as water or solvents; carbon-graphite bearings (models with suffix “-CB”) are standard. CAUTION: LIQUIDS CONTAINING SOLIDS ARE NOT RECOMMENDED FOR USE WITH GEAR PUMPS. Comes with gear pump head, motor, and complete operator's manual. **Refer to Performance Table above for recommended horsepower (HP) and flowrate (GPM) information. Standard units come with carbon bearings which require no lubrication. Comes complete with gear pump head, motor, and operator's manual. Comes complete with operator's manual. **Refer to Performance Table above for recommended horsepower (HP) and flowrate (GPM) information. Standard units come with carbon bearings which require no lubrication.